It's been so hot here that doing anything outside is insane so I have been working on getting my brads and charms reorganized. I don't use a whole lot of charms but there are times I like to add them to pages or cards so I do have a few. 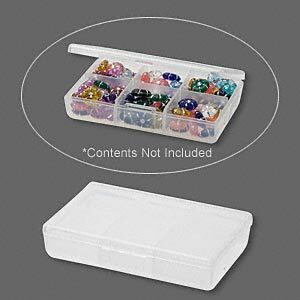 I ordered some of the 6 compartment containers from FireMountain Gems and Beads and they were the perfect thing I had been searching for. They were $9.95 for a pack of 10 and that price was cheaper than any other place I could find for what I wanted. Their shipping price is phenomenal as well! 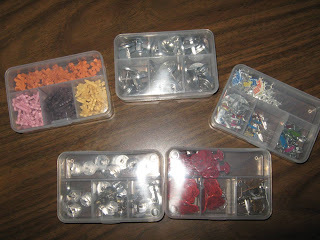 These are almost exactly the same size as the containers the Spare Parts brads come in from Hobby Lobby and that was what I had been searching for. 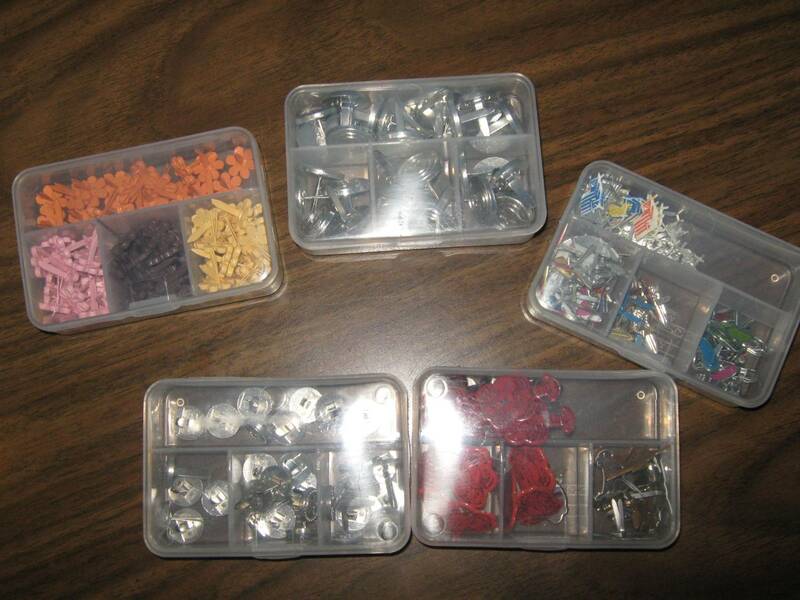 I even searched for pill boxes and found some but they were all about $2-$3 each, which I thought was ridiculous! Here you can see I have my Basic Grey brads and buttons organized in the containers and have them labeled. This will make it easy for me to grab my embellies for the paper collection I am using and decide what I want to use. Getting the buttons in there took a bit of work and much like figuring out a jigsaw puzzle but persistence paid off and I was able to get them all in one container. And for those wondering, no that is not all of my Basic Grey embellies...ya'll know I have a craving for anything Basic Grey! 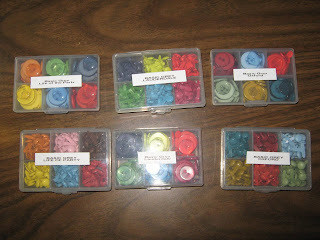 A wonderful crafty friend of mine, Mona, sent me these 5 compartment containers. She was wanting to get rid of them and while they weren't the 6 compartment ones I was looking for they still came in handy for some other things. I have some of my Stampin Up brads in some of them and then various others by theme, in the picture there is beach and sea life. Since I got my Plaid Essentials Spinner back out I have my brads stored in it so I can have them out on my table and grab them easily. I use brads more than any other embellishment and probably use them on most every project I do. 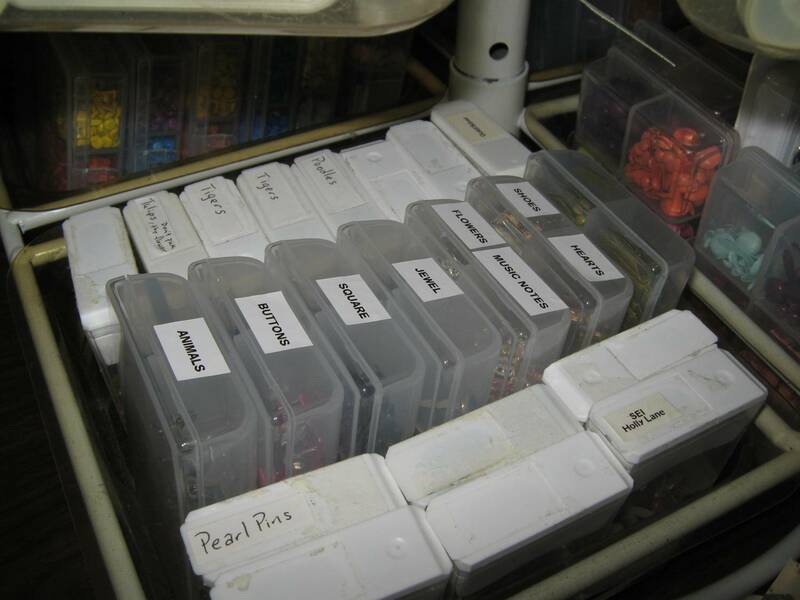 I have most of them labeled so I can see what is in the container without having to lift each one and look at it. Here is a picture of my Plaid Essential Spinner on my table. 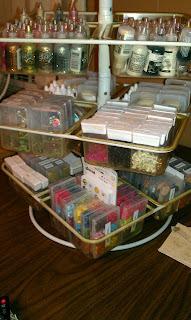 I also keep my Cat Eye Chalk Inks, refills as well as Stickles and Liquid Pearls in the spinner. When not in use I like up the squares and push it flush with my wall where it is out of the way but when I need to look for something it is easy to slide it out spin it around and then return when I am done. I would like to say thank you to all of my readers who have offered words of encouragement. I feel I am truly blessed with the best readers out there. You guys come here for me, not because I do giveaways, but because you want to see what I am up to and read what is going on in my little corner of the world. Without a doubt I have the most loyal and kind readers in the blogging world!! Now I'm jealous! I still need to finish mine. But yours looks great! I recently commented on Everyday Cricut that my favorite thing about my Cricut is the many "friends" it has led me to...and I do consider you one of my online friends! While we will likely never meet, I check in on you daily and become concerned about you when you are silent for a few days....I love hearing your stories and thoughts and rarely (if ever) disagree with your thought process. Which might be a concern for the rest of the world! Thanks for all that you share! Okie, another great idea. You must be the most organized girl in the world. Looks great! Seems like you are in a much better mood/state of mind today :) glad to hear you sound a little more back to normal :) We all love ya!